We are really excited to see our People Make Places Lane Cove Time Capsule filled this week with magical matchboxes! 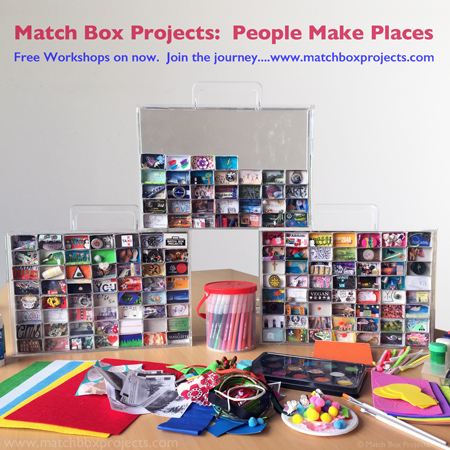 Join us at one of our depots to collect a matchbox, drop off your completed masterpieces or use our creative corner to create your own impression of Lane Cove. Feel free to bring anything from home to include in your box! We will be out and about in Lane Cove on Sunday until about 6 including at the Farmers Markets at Lane Cove Public School in the morning and conducting a free workshop at the Alive office in the afternoon. (12.30-2). If anyone would like to collect a matchbox or deliver theirs please phone or text us. All family, friends and work colleagues are welcome to pick up one of our signature matchboxes and join the journey! If you can’t make anyone the above times contact us and we will do our best to meet you at another time. This entry was posted on Monday, September 28th, 2015 at 7:43 pm	and is filed under Our Blog. You can follow any responses to this entry through the RSS 2.0 feed. You can leave a response, or trackback from your own site.